This might seem like a very short cooking time (especially if you want to eat the lamb pink), but that is the wonder of butterflied lamb. The meat is so spread out that the heat doesn’t have far to penetrate. I leave the fat on to get a good flavour; those who don’t want to eat it can cut it off. Sekenjabin is a Persian mint syrup, but this version is less sweet and thick than they would normally have it. I like it better, to be honest; it’s lighter and cuts through the meat better. In Iran, sekenjabin is taken on picnics and lettuce leaves are dipped in it. Pairing it with lamb seems like a lovely Anglo-Persian mix. Serve with wholemeal flatbread or a whole grain side dish. Broad beans are also perfect on the side, if you want another vegetable. 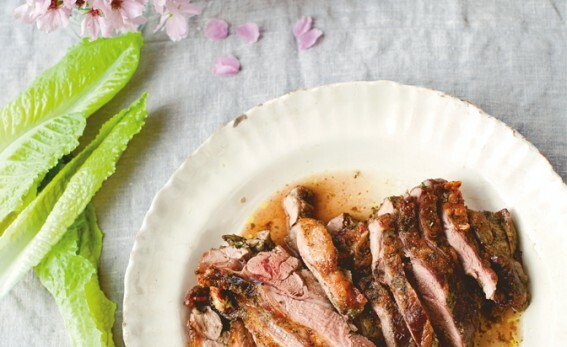 This makes a wonderful celebratory spring or summer meal. Make the sekanjabin the day before (just to get it out of the way). Put 300ml (½pint) of water into a saucepan with the sugar and bring gently to the boil, stirring to help the sugar dissolve. Add the vinegar, reduce the heat and simmer for 15 minutes. You should end up with a syrup (it will thicken as it cools, though even then this is not a thick syrup). Take off the heat and add one-third of the mint leaves. Leave until cold, strain the mint out and refrigerate the syrup until you want to serve it. When you are ready to cook the lamb, preheat the oven to 220℃/425℉/gas mark 7. Pierce the lamb all over with a small sharp knife to make little slits. Put the garlic, mint, salt and pepper into a mortar and grind it, adding the oil. You should end up with a rough paste. (A mini food processor will do just as well as a mortar.) Push this paste into all the slits in the lamb. Now rub some oil over it and season well. Spread it out in a roasting tin, fatty side up. Put it into the oven and cook for 15 minutes. Reduce the oven temperature to 190℃ /375℉/gas mark 5 and cook for another 15 minutes. The lamb will be pink. (If you want it more well done then increase the cooking time by five minutes.) Cover with foil, insulate and leave to rest for 15–20 minutes. Chop the rest of the mint for the sekenjabin and add to the syrup. Put the lettuce leaves into a broad, shallow bowl and serve them with the lamb, along with a smaller bowl containing the sekenjabin. Guests should dip the lettuce leaves in the sekanjabin and add them to their lamb. Serve the lamb’s cooking juices, skimmed of excess fat, in a warm jug on the side.